The fluorescent microscope uses a high-pressure mercury, halogen, or xenon vapor lamp that emits a shorter wavelength than that emitted by traditional brightfield microscopy. These light sources produce ultraviolet light. When ultraviolet light hits an object, it excites the electrons of the object, and they give off light in various shades of color. Since ultraviolet light is used a larger amount of information can be gathered; thus, the resolution of the object increases. Fluorescent cells. : Fixed endothelial cells stained with fluorescent dyes. 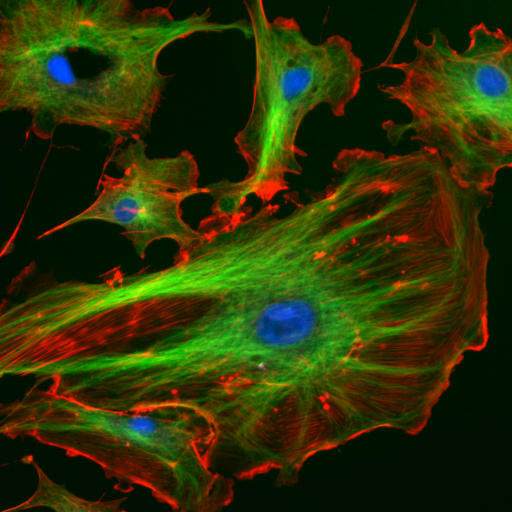 Nuclei are stained blue with DAPI, microtubules are stained green by an antibody bound to FITC and actin filaments are labelled red with phalloidin bound to TRITC. This laboratory technique employs fluorescent dyes chemically linked to antibodies to help identify unknown microorganisms. This method uses the specificity of an antibody to its antigen to deliver a fluorescent dye to a target molecule. A filter is used to block the heat generated from the lamp and to match the fluorescent dye labeling the specimen. An additional barrier filter between the objective and the detector can filter out the remaining excitation light from fluorescent light. Fluorescent dyes—molecules that absorb light of one wavelength and then re-emit it at a longer visible wavelength—can be used alone or in combination to gain specificity of the stained structure being visualized. The light emitted from the fluorophore is magnified through traditional objectives and ocular lenses. Staining organisms with these special dyes reduces the non-specific autofluorescence that some organisms can emit. Cells or organisms stained with fluorochromes appear colored against a dark background when fixed on a glass slide. Fluorescence microscopy does not allow examination of live microorganisms as it requires them to be fixed and permeabilized for the antibody to penetrate inside the cells. In fluorescence microscopy, specimens are first stained with fluorochromes and then viewed through a compound microscope by using an ultraviolet (or near-ultraviolet) light source. Microorganisms appear as bright objects against a dark background. Fluorescence microscopy is used primarily in a procedure called fluorescent- antibody (FA) technique, or immunofluorescence.